Can Pregnant Women Eat Chia Seeds? Shannan Bergtholdt, a registered dietitian since 2003, has a Bachelor of Science in nutrition and a Master of Science in Education in exercise science and wellness. Her research in aerobic training and nutritional screening has been published in two peer-reviewed journals. Her mission is sharing practical ways to incorporate healthy eating into any lifestyle. Good news for mindful moms-to-be: You can add chia seeds to the list of “safe” foods during pregnancy. Chia is a versatile seed that contains many key nutrients important for a healthy pregnancy. In fact, just 2 tablespoons of chia seeds supply nearly all the additional daily calories and nutrition needed during early pregnancy. Chia seeds (Salvia hispanica) are derived from a plant in the mint family. Although a relative newcomer to the American diet, chia was a staple food in the ancient Aztec diet. This ancient food has found its way onto shelves of many grocery stores and can be easily incorporated into a modern-day healthy eating plan for pregnancy. Chia seeds are one of few foods that combine all the important nutrients for a healthy pregnancy, making it truly a super food. Pregnant women should consume extra calories to support the growth of their own bodies as well as the growth of the baby. Protein and calcium needs are higher during pregnancy to support tissue development and bone growth. Iron is also an important mineral during pregnancy because maternal and baby blood volumes are increasing. 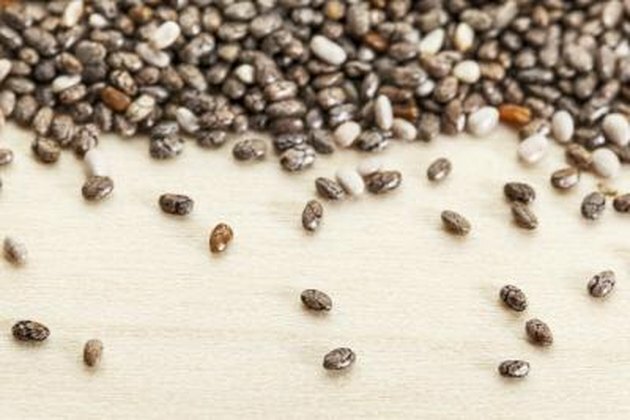 Finding foods that meet all of these nutritional requirements may seem a daunting task -- that is, until you add a single serving of chia seeds. Two tablespoons of these little chia seeds pack a big nutritional punch, providing 138 calories, about 8.5 grams of fat (primarily omega-3 fatty acids), 4.5 grams of protein, 11 grams of carbohydrates and 9 grams of fiber. Chia seeds are also a good source of calcium, iron and vitamin A. One serving of chia seeds provides a pregnant woman with over 15 percent of her protein needs, over a third of her daily fiber needs and nearly all of her additional calorie needs for the first trimester. Chia seeds are primarily sold in their raw, dried form. They can also be found in many packaged foods, such as breads, cereals, granola bars and crackers. Chia seeds have a mild, nutty flavor, making them a delicious addition to many foods. Getting a nutritional boost during pregnancy can be as simple as adding a serving of chia seeds to your everyday meals and snacks. Sprinkle chia seeds on cereal, yogurt or salad. Try mixing chia into breads, bars and smoothies to give your foods a nutritional bonus. Despite the nutritional benefits of chia seeds, opinions among medical practitioners vary on whether pregnant women should eat them -- and if so, for how long. Before adding any new food to your diet, check with your prenatal care provider to ensure that chia seeds are a good fit for you and your balanced eating plan. Can Certain Foods Increase Fetus Growth? Are Sweet Potatoes Good for Pregnant Women?